This module allows you to schedule sending emails, inviting your buyers to post comments and review on their purchased products. You will increase the number of comments on your product pages. It helps your shop by collecting information and adding content to it. Create a link between you and your customers, take the time to know their satisfaction towards a product that you sell. The number of comments on a product can reassure other consumers to purchase. With the “Analytics Tracker” you can count the number of reviews make by the module. With statistics you can have your own states. Increase quickly and easily your number of reviews on your product pages ! Your pages are highlighted in Google results thanks to Google Rich Snippets (also called Structured Data). Yellow stars will appear below your results in Google making them more visible. Seeing reviews makes your new customers more confident about your products and your shop. Your customers are enhanced by the importance you give them by asking them to give their review. • Automatic sending of reminder mails to your customers inviting them to leave a review. • It is possible to set the delay and the order state after which the reminder mail must be sent. For instance, you can decide to send a mail 7 days after an order has been put in the order state Delivered or multiple selectable statuses. • Allows the merchant to reward the customer posting a review with a discount coupon encouraging them to make a future purchase. 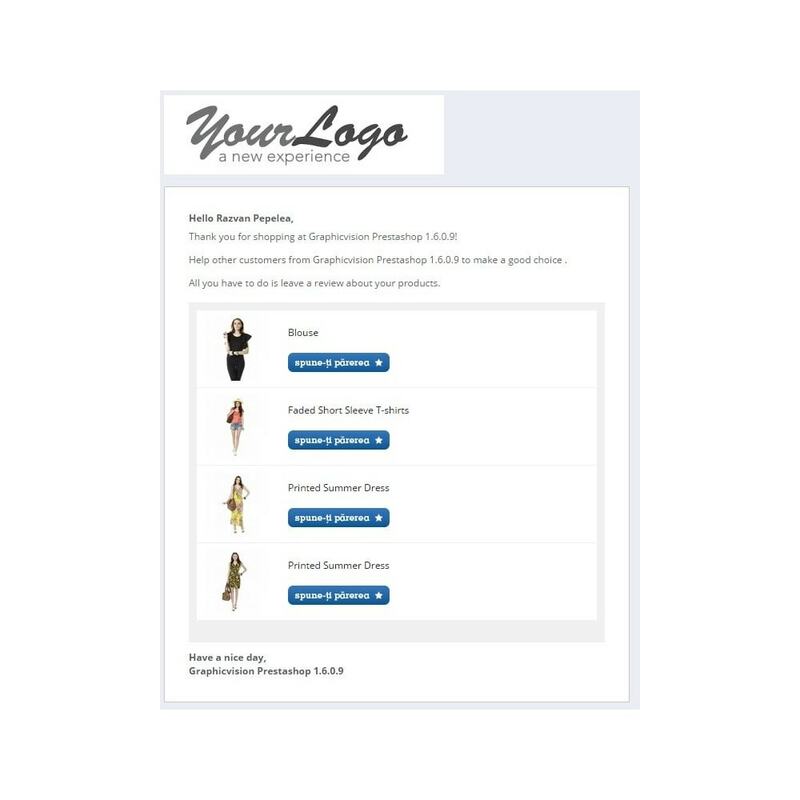 • As an extra feature, every logged in user that has previously purchased a product, when visiting the site, they will receive a small floater in right bottom corner encouraging the user to leave a review. Be careful, only the order passed AFTER the installation are concerned about the module. 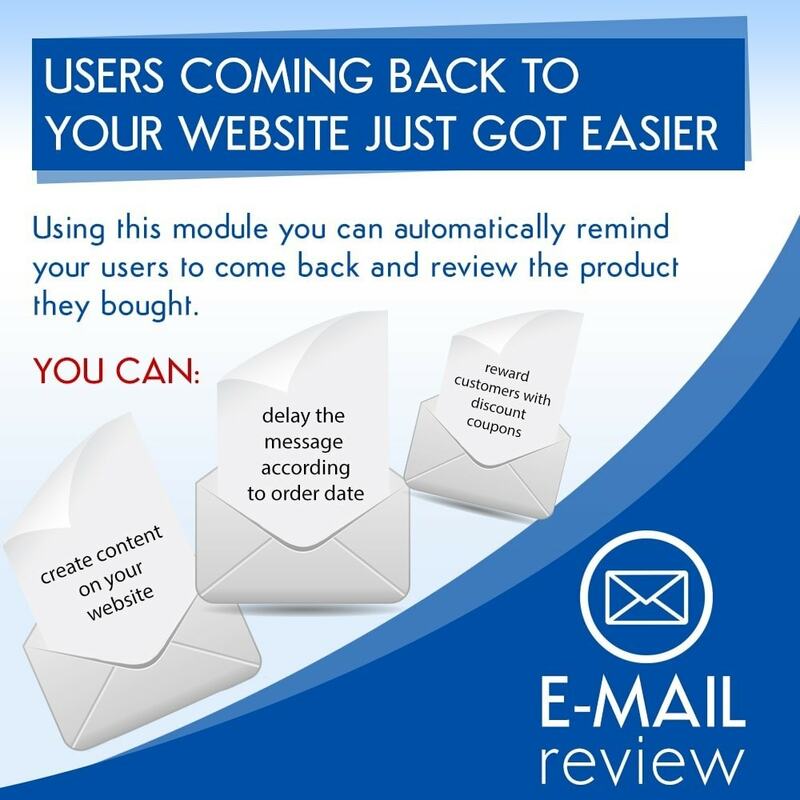 This module allows you to schedule sending emails, inviting your buyers to post comments and review on their purchased products. You will increase the number of comments on your product pages. Your customers can express their opinion about the products bought from your shop. Be in contact and directly give a comment to the shop. Future buyers have plenty of comments. This module only works with the prestashop native module "Product Comments", make sure you have installed and activated that module. Your "Product Comments" module must be set to accept comments from guests. If you are using another module for your customers reviews, contact me so that I can make it compatible with the module Reviews development. 3. Complete every section with the necessary values needed. 3a. Comment Reward section – Set this section to “Yes” and complete all the fields to reward the customers with a discount coupon after the he has posted a comment. 3b. 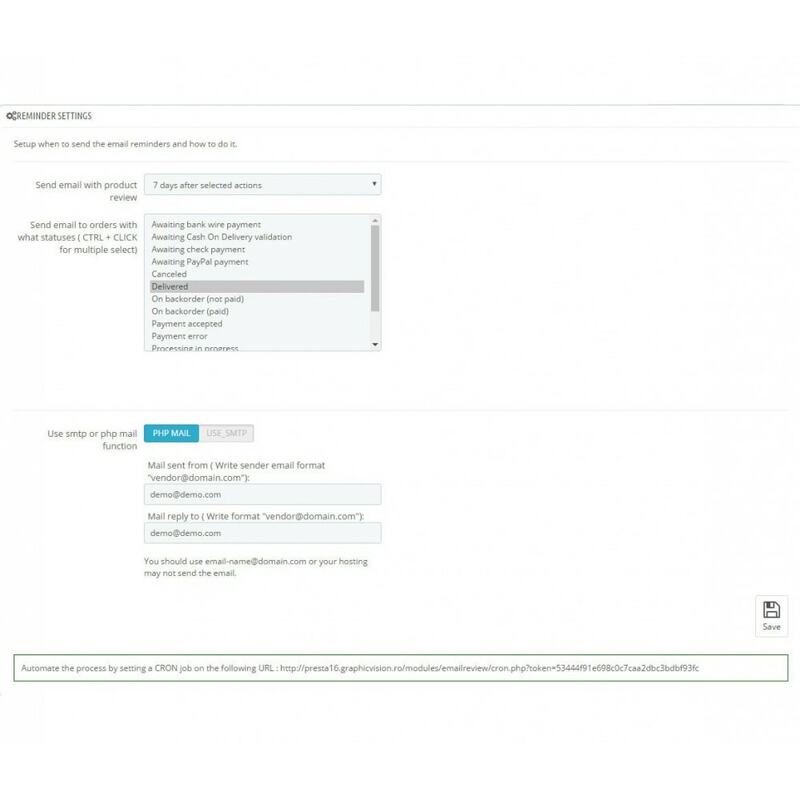 Invite to Review Floater Settings Section – When a customer is on the site a floating element will appear in the bottom right corner to encourage him to review a product he ordered, select “Yes” to turn this on, and complete the text that is displayed in element, or “No” to disable it. 3c-1. “Send email with product review” – the number of days after the purchase when to send the review email, some products need a bigger testing time, for example electronics, and it’s best to select a bigger time period. 3c-2. 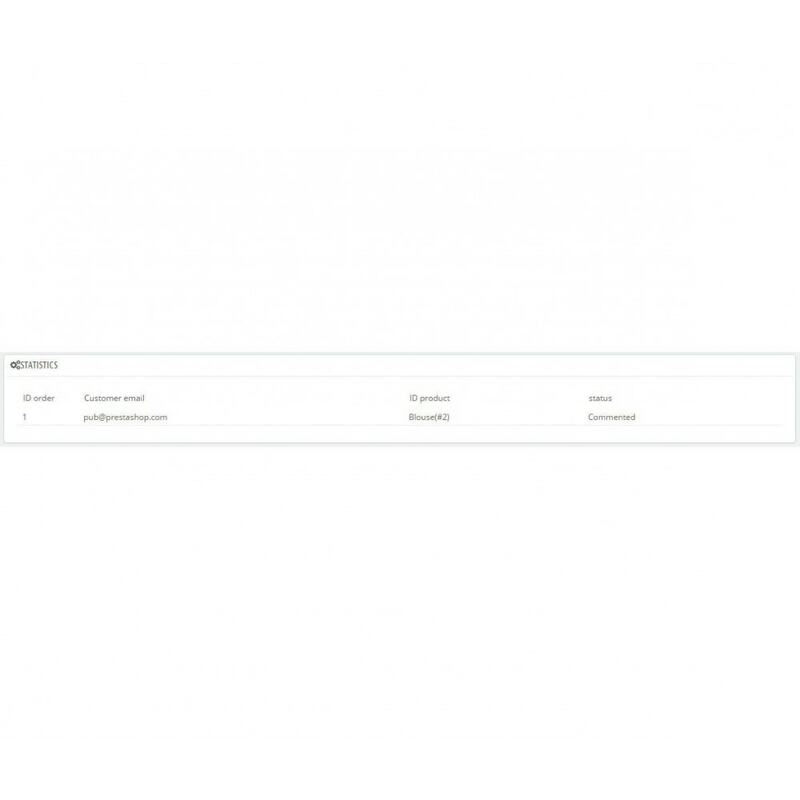 “Send email to orders with what statuses ( CTRL + CLICK for multiple select)” – depending on each shop, order statuses may differ, so select the order type to which to send the reminders, for example there is no point in sending mails to canceled orders. 3c-3. “Use smtp or php mail function” – select php to use the native php native function, or if you are an advanced user, select SMTP and complete all the details, it’s better to use the SMTP type, because it will lower the spam rate. 3d. 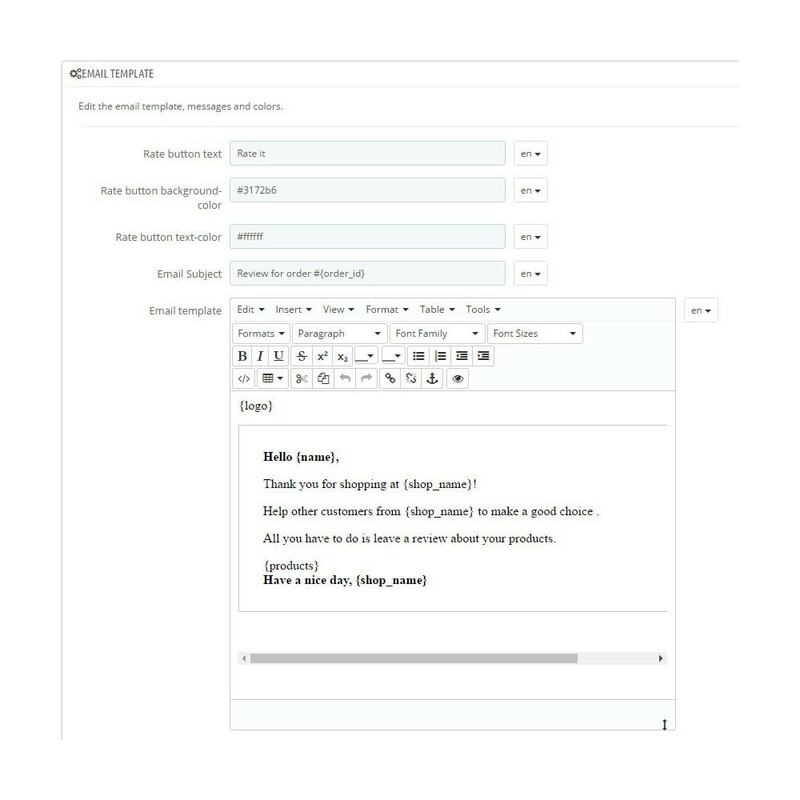 Email previewSection – Configure the email template based on your preferences with the HTML editor and helper form, you can use the following template tags in the content , ,, , , to help you personalize the email. 3f. Statistics Section – see the emails sent and if the user has commented based on that email. 4. Activate prestashop’s native module "Product comments"